The Tonkin Gulf Resolution (officially, the Southeast Asia Resolution, Public Law 88-408) was a joint resolution of the United States Congress passed on August 7, 1964 in response to two alleged minor naval skirmishes off the coast of North Vietnam between U.S. destroyers and Vietnamese torpedo ships from the North, known collectively as the Gulf of Tonkin Incident. 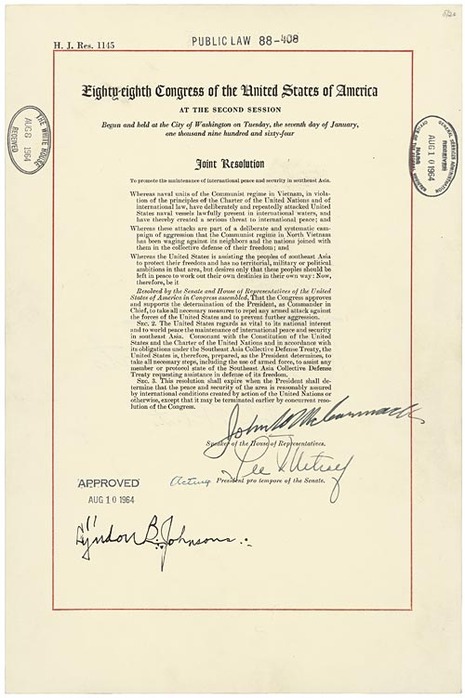 The Tonkin Gulf Resolution is of historical significance because it gave U.S. President Lyndon B. Johnson authorization, without a formal declaration of war by Congress, for the use of military force in Southeast Asia. Specifically, the resolution authorized the President to do whatever necessary in order to assist "any member or protocol state of the Southeast Asia Collective Defense Treaty." This included involving armed forces. 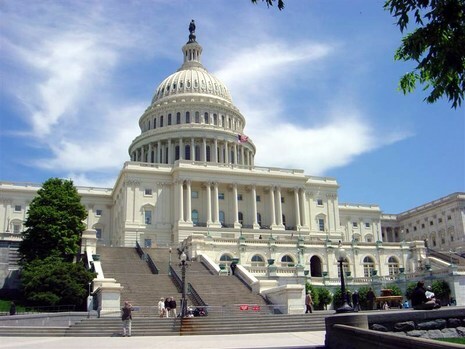 The unanimous affirmative vote in the House of Representatives was 416-0. (However, Congressman Eugene Siler of Kentucky, who was not present but opposed the measure, was "paired" with another member who favored the resolution — i.e., his opposition was not counted, but the vote in favor was one less than it would have been.) It was opposed in the Senate only by Senators Wayne Morse (D-OR) and Ernest Gruening (D-AK). Senator Gruening objected to "sending our American boys into combat in a war in which we have no business, which is not our war, into which we have been misguidedly drawn, which is steadily being escalated." 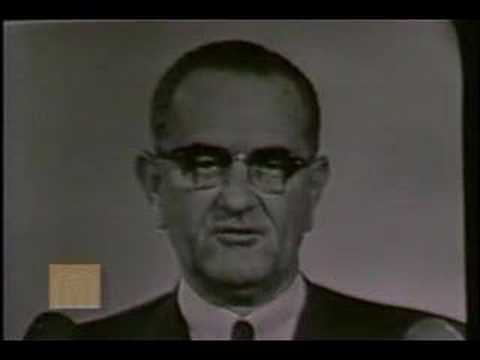 The Johnson administration subsequently relied upon the resolution to begin its rapid escalation of U.S. military involvement in the Vietnam conflict. "It is not simply that there is a different story as to what happened; it is that no attack happened that night." In truth, Hanoi's navy was engaged in nothing that night but the salvage of two of the boats damaged on August 2.